Madison Scott is a friend we spent time with when she visited her Aunt in Prague. Her parents too. Her Aunt Colleen is my very good friend who was my wife Gabi’s maid of honour at our wedding this year. 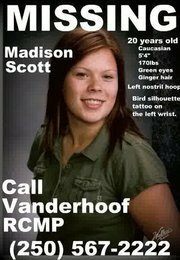 Maddy has gone missing near her home town of Vanderhoof, British Columbia, Canada and most of us can only imagine the nightmare this is for her family, and who knows for Maddy. Please watch this video below and share the information with people you know.